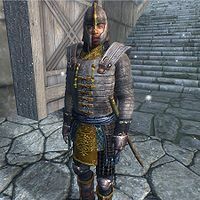 Cyrus is a Redguard Blade who resides at Cloud Ruler Temple in the Jerall Mountains north of Bruma. He is the first Blade to greet Martin Septim and Jauffre when they arrive at Cloud Ruler Temple. Cyrus wears the usual set of Blades armor, including a cuirass, boots, greaves, helmet, and gauntlets. He sleeps in a brown shirt and light brown linens. He carries an Akaviri katana and a small sum of gold. Cyrus is one of the three Blades entrusted with the duty of guarding the front door, which he does from 12am to 8am. He is relieved by Jena and spends the next eight hours (from 8am to 4pm) guarding the Imperial Suite. He eats dinner at the East Wing from 4pm to 8pm and then sleeps from 8pm to 12am. During the Weynon Priory quest, when you arrive at the Temple with Martin and Jauffre, Cyrus will rush down to the main gate and be the first to welcome you. He will then ask Jauffre: "Grandmaster, is this ... ?" to which Jauffre will respond: "Yes, Cyrus. This is the Emperor's son, Martin Septim." Cyrus will then turn his attention to Martin: "My lord! Welcome to Cloud Ruler Temple! We have not had the honor of an Emperor's visit in many years!" After Martin's response, Cyrus will turn around and join the other five Blades lined up in the courtyard, ready to salute the new emperor. After that, Cyrus will return to his regular duties but will assure you: "Don't worry, we'll keep the Emperor Martin safe here. No enemy has ever taken Cloud Ruler from the Blades.". Like many of the Blades, he is named after a historical figure, namely Cyrus, a leader in the Stros M'Kai rebellion of 2E 864.